A number of advanced techniques have emerged, partly resulting from consultation with users, and have been included in the latest Fast Track PPM & PPM version 3. Some of these techniques may not seem crucial to an organisation that does not yet have automated PPM (typically data building is the initial focus), but over time the techniques can save significant resource costs. Concise PPM PERFORMANCE MEASUREMENT reporting for your customers. The "visit timeliness" refers to the condensing of each visit so that similar tasks on similar assets are grouped into one "status". Statuses are COMPLETED ON-TIME, COMPLETED LATE, OVERDUE and PLANNED. Visits can be reviewed by building or site - for instance a visit to perform a Quarterly Inspection on 4 boilers at the same site on the same day, would be measured as 1 item. In the software screenshot on the right, coloured squares indicate timeliness for tasks performed upon multiple assets. Simply assign our ASSET TYPES to your ASSET REGISTER and the software will generate the PPM Plan. Based on a known range of building asset types, iiS and partners can provide the PPM Processes necessary to carry out planned maintenance. The PPM Processes are associated with asset types, which are then assigned to your assets. The last step is to provide a PPM cycle start date and default service provider for each asset, and then software will co-ordinate all the data and generate a full PPM Plan, including forecasted PPM Task Dates. Simplify PPM Job Paperwork and Updates. If you are required to keep a per asset job history, PPM jobs can still be compressed such that all tasks of the same type, for the same building and on the same day are grouped together. No additional data is required to use this mechanism. When such jobs are updated, records for all assets in the group are updated. New assets to inherit the PPM tasks of similar existing assets. After adding new assets, a single click per asset invokes a mechanism whereby you set a start date and contractor, and the software generates tasks for the asset automatically. The process works by inheriting PPM Tasks from other similar assets, and the graphic indicators for the PPM Task Dates can be seen immediately. Track Asset details using your own Documents. 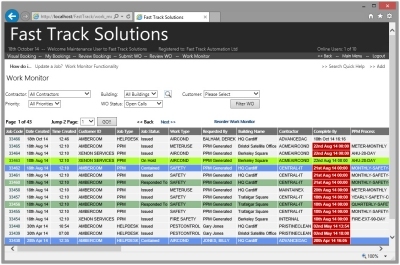 If you group assets together for simplification, such as an example PPM Task being "Quarterly check on all fire extinguishers in the building", additional details can be kept in documents such as Excel spreadsheets, which are tied to the PPM Task, and can be opened with a single click. PPM Documents also form part of the Customer Document Management mechanisms. Service Providers remotely indicate Response and Completion in Real Time. Using Fast Track Mobile for Smartphone, service providers receive work instructions and perform updates on their iPhones, Blackberries and Android Smartphones. This means accurate LIVE data, less time in the office, and less work for back-office staff. Customer completion signatures can also be captured.